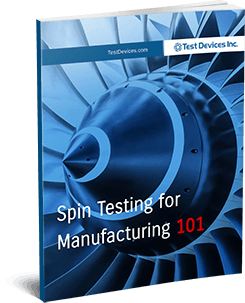 Spin Pit Testing | Test Devices Inc.
Test Devices, Inc. is committed to providing high quality spin pit testing services and products that meet or exceed our customer’s requirements. Our quality system is updated on an annual basis, and internal and external audits are conducted to ensure its robustness. Test Devices has held an AS9100/ISO9001 certificate since 2006. Test Devices is committed to providing high quality services and products that meet customer requirements while maintaining a fair profit margin and increasing sales. We accomplish this through product and process innovation, compliance with AS9100 requirements, and the continual improvement of our Quality Management System. 100% of all hardware manufactured to Test Devices’ drawings are dimensionally inspected by our inspectors. Spin tests are carried out to comprehensive technical plans approved by our quality group and customer. Test data for low cycle fatigue tests are audited to ensure compliance to speed and temperature requirements for each cycle and reported to the customer. Three customer-trained designated quality release personnel (DQRs) for self-release of parts. Approved vendor list with yearly quality audits and ranking based on vendor performance.